Why Are Drivers Excited About the Volvo S60 Dynamic Trim? Perhaps one reason the Volvo S60 Dynamic is again being recognized as a popular compact luxury sedan has to do with the trim features. Take a closer look at the trim features that have drivers excited today. The reason it is so hard to not miss the Volvo S60 Dynamic coming down the road is because of the Active Dual Xenon headlights. These headlights work hard to stand out, giving other drivers the chance to see your vehicle with ease. They also help the driver to be able to safely navigate the roads during inclement weather. Looking at the interior design of the Volvo S60 Dynamic, you will be impressed from seats to dash. The metal is bright and has a fine geometric pattern that appears to be three-dimensional. That satin finish also helps to make the patterns more visible too. 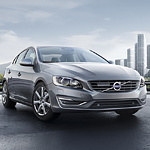 Come by Principle Volvo Cars of San Antonio today and you can take the Volvo S60 Dynamic for a test drive.